Tamil movies that are set in the rural heartland of the state in areas surrounding Theni and Madurai, are dime a dozen. Characters in such movies have always been portrayed as impulsive, edgy and they resort to wicked, taunting language and violence at the drop of a hat. Madha Yaanai Koottam (MYK) joins the long list of such movies. The film is about a respected village man who has two wives, the hatred within his family, a murder and the ensuing manhunt. The main factor that works against the movie is the lack of emotional connect for the audience with the narration. There are a plethora of characters and at the end, not many faces register in mind. Death rituals and festivities (referred as ‘Seimurai’) have been elaborately recorded. Kudos to the director, for the idea ! Kathir as the lead hero Parthi acquits himself fairly well. Oviya has an inconsequential role as his love interest. Since she plays a Keralite in the movie, there are a few segments in the second half in the pristine backwaters of Kerala where the pair share a few close moments over a duet song. There are many unknown actors in the movie and the director has extracted decent performances from them all. Viji Chandrasekhar puts her experience to good use and plays the tense, cornered ‘first wife’ with ease. The actor who plays her brother also shines as the lead antagonist. N.R.Raghunanthan’s numbers are mostly used to tell the movie’s tale through the lyrics and save one needless duet song, the rest are well used. Kona Kondakari number, sung by G.V.Prakash, is peppy. The BGM score adds value to the movie and complements the tense scenes very well. Good work by Raghunanthan. Rahul Dharman’s work on the camera gives the movie a raw and sleek look. The stunt choreography is realistic and in one brawl scene, Kathir and another actor literally kick each other and roll all over the place. Though MYK has a few tense and gripping sequences, the milieu is something which we have seen in plenty of celebrated movies in the recent past. And violent scenes, actions and language don’t make it suitable for viewers of all ages. Still with all its drawbacks, Vikram Sugumaran’s debut isn’t a bad watch overall. Madha Yaanai Koottam (aka) Madhayaanai Koottam is a Tamil movie with production by GV Prakash Kumar, K Venkatesh, NPKS Logu, direction by Vikram Sugumar, cinematography by Rahul Dharman, editing by Kishore Te. 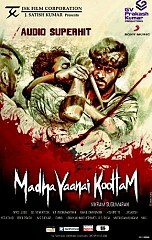 The cast of Madha Yaanai Koottam (aka) Madhayaanai Koottam includes Kathir, Oviya, Viji Chandrasekhar.